The 1 3/4" diameter is designed for Dance Studios. It will require a thicker diameter dowel/barre. The surface is powder coated with a Beautiful Dark Antique Bronzed Texture. It will fit aesthetically in any studios. All the corners are rounded to give a smooth and subtle appearance to blend into the surrounding. It is very sturdy and built with quality in mind. We offer 1 years warranty behind our work. 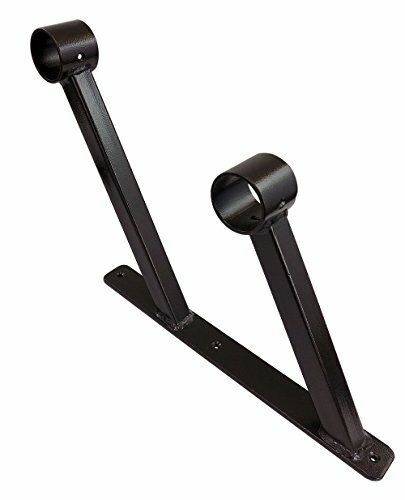 This listing is for ONE bracket only, You must have minimum of 2 brackets to support a barre. This bracket will fit wood rod/dowel that is approximately 1 3/4" in diameter. This is a very typical ballet barre diameter. -All holes are countersunk so the screw bolt head is not protruded. -Bracket extension from wall: 9"
If you have any questions about this product by DuroBarre, contact us by completing and submitting the form below. If you are looking for a specif part number, please include it with your message. Ballet Stretch Band by EverStretch, don’t settle for less: Premium 2-layer Dance Stretch Band for Hands Free Flexibility Training. Ballet Band Stretching Equipment for Dance, Cheer and Gymnastics.